No single aspect of Amazon.com's → business model is sufficient to create a → sustainable competitive advantage. It is the synergistic combination of all of these information services and logistical processes that → creates value for customers and comprise Amazon.com's competitive advantage. Amazon.com is a company that is closely tied with the e-commerce phenomenon. Jeff Bezos, the founder of the company, → broke the rules of the book business by using the Internet rather than conventional distribution channels. Based in Seattle, USA, the company has grown from a book seller to a virtual → Wall Mart of the Web selling products as diverse as music CDs, software, office products, electronics, toys, games, cookware, hardware, food, and health products. The company has also grown at a tremendous rate. Amazon.com was founded by Jeff Bezos, a computer science and electrical engineering graduate from Princeton University. Bezos had moved to Seattle after resigning as a Senior Vice-President at D.E.Shaw, a Wall Street investment bank. He didn’t know much about the Internet. But he came across a statistic that the Internet was growing at 2300%, which convinced him that it was a large growth opportunity. Not knowing much more, he plunged into the world of e-commerce with no prior retailing experience. Bezos chose to locate the company in Seattle because it had a large pool of technical talent and since it was close to one of the largest book wholesalers located in Rosenburg, Oregon. He was thinking of the company as a bookseller at the beginning. Moreover, the sales tax laws for online retailers state that one has to charge sales tax in the state in which one is incorporated. Therefore it was logical to locate in a small state. The company was started in a garage. Initial business meetings were conducted at a local Barnes and Noble store. Bezos picked the name Amazon for his company because it started with the letter A, signified something big, and it was easy to spell. The company went online in July 1995. 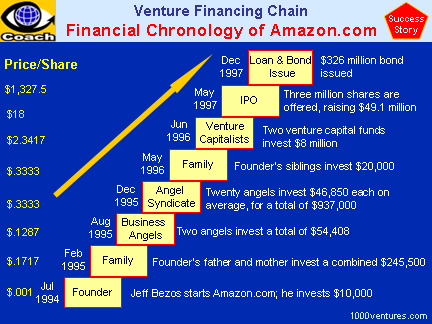 In May 1997, Amazon.com went public. Maintaining and improving operational efficiencies is the key to sustainable competitive advantage of Amazon.com. The ability to offer shopping convenience, ease of purchase, speed, decision-enabling information, a wide selection, discounted pricing, and reliability of order fulfillment are all tied directly to the company's logistical competencies. By purchasing large volumes of products directly from publishers the company offers a wide selection to customers and receives great discounts from suppliers. Amazon.com aims to ship 95% of products on the day they are ordered. Direct model enables Amazon.com to shorten shipping times. The company invested also heavily in warehousing and material handling systems to achieve multifold improvement in throughput. Amazon.com has steadily increased its spending on advertising and promotion to make its brand stronger and build brand equity. By 2003, the brand of Amazon.com was worth US$ 22 billion. "A brand for a company is like a reputation for a person. You earn reputation by trying to do hard things well," says Jeff Bezos, the founder of Amazon.com. Amazon.com works hard to achieve → value-added → differentiation through customer-focused information services. Amazon.com's site retains customer preferences and provides automated customization for users. Jeff Bezos has a vivid → vision for how this technology will be used: "Personalization is like retreating to the time when you have small-town merchants who got to know you, and they could help get the right products. The right products can improve your life, and the wrong products detract from it. Before the era of mass merchandizing, it used to be that most things were personalized. The purpose of ... customization is ... you get the economies of mass merchandising and the individuality of 100-years-ago merchandising." Amazon.com's market success depends on its ability to maintain and grow its customer base by knowing and serving its customers → better than its competitors better than its competitors and providing a higher level of value-added differentiation in customer service. Due to high level of customer satisfaction, repeat customers account for approximately 60% of Amazon.com's orders. Launched in 2006, AWS is a collection of web services that together make up a cloud computing platform, offered over the Internet by Amazon.com. AWS is → outpacing its cloud computing competitors in terms of product innovation as it adds many new features each year and moves very fast.